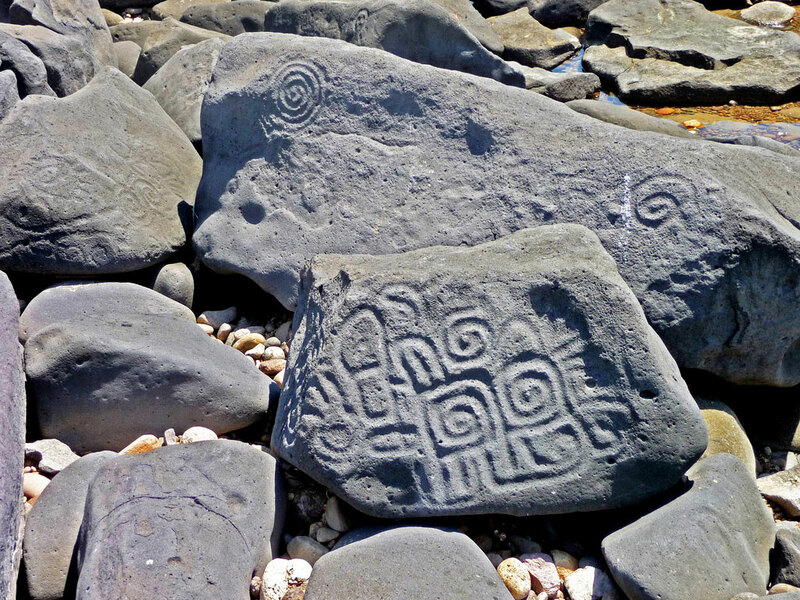 Fifty miles north of Mazatlan in Sinaloa State, north west Mexico, there is a beach known as Las Labradas where the rocks are covered in over 600 petroglyphs. Now Mexican investigators have uncovered archaeological sites in the vicinity dating to the Archaic period (2500-1000 BCE) along with another later site that may provide clues to the creators of the Las Labradas petroglyphs. To date there are 22 locations around the rocky outcrop with evidence of human activity, of which, between 2010 and 2012, four were studied: The Flower of the Ocean, The Sprig, Lomas del Mar and Arroyo La Lomita. Joel Santos Ramirez, from the National Institute of Anthropology and History (INAH) and his team discovered an Aztatlán (750-1250 CE) site, consisting of ceramics and a multiple burial of five individuals: two adult males, two adolescents (one male and one female) and a possible female infant. All except the child have dental mutilation with “V” filed teeth and two had cranial deformation, cultural practices that were common among the peoples of Sinaloa. The physical characteristics of the burial allowed Joel Santos to attribute the site to a local culture fitting into the chronology of the western Aztatlán, corresponding to between 1250 and 750 years ago, contemporary with the Postclassic Mesoamerican ‘Chicayota‘. Among the pottery discovered was one piece, decorated with concentric circles which is one of the symbolic elements present in many of the Las Labradas petroglyphs, though it is still difficult to relate to the rock engravings to the settlements under investigation and whether they belong to the earliest inhabitants of Sinaloa or the later Chicayota culture. Ramirez suggests that it may even be both cultures as people who created rock art may have been following older traditions. At the Lomas del Mar site, more pottery and shell debris from the Aztatlán period was discovered and also at Arroyo La Lomita, located 3 kilometres inland, though this time the ceramics and artefacts were associated with petroglyphs. via Who created Las Labradas petroglyphs? : Past Horizons Archaeology.